kathyskreations: EVER HAVE ONE OF THOSE DAYS? This is very pretty, Kathy. So glad you bought that stamp. I love what it says. Did the glue pad work well with the glitter? It looks like it did. 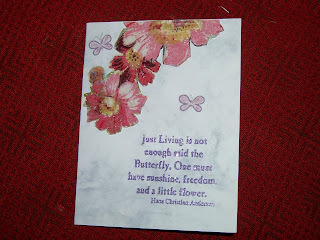 Very pretty card, Kathy! I love the flowers! Great job! !